Why go abroad? 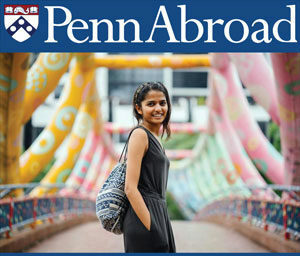 Read about the benefits on the Penn Abroad website. Studying abroad fosters understanding of cultural differences and how to function effectively in a range of societies, and students often find their study abroad experience to be a defining moment in their educational and personal growth. Going abroad for a semester is an exceptional opportunity to learn a language, experience a different culture, discover new strengths, and gain a more sophisticated global view. Students interested in studying abroad should begin planning at least one year in advance. Most students choose to go abroad as juniors. Students have a number of program options, including Wharton-approved programs, where they can take business and liberal arts courses, and College-approved programs, where they can take courses that satisfy non-business requirements. Meet any additional criteria outlined by Penn Abroad. Research your location and program options (Penn Abroad also hosts information sessions where you can learn more). Meet with the appropriate Penn Abroad Overseas Program Manager and Wharton academic advisor well in advance of your program deadline. Prepare to go! Visit Penn Abroad to learn all you need to know. All courses abroad must be taken for credit; you may take one class pass/fail as long as this is approved by a Wharton academic advisor at least five weeks before the course start date. Once the grades have been submitted via the External Course Approval Tool (XCAT), they will be calculated as part of the student’s cumulative GPA at Penn. Business courses can only be taken at Wharton-approved study abroad programs. Students may also choose to participate in the Wharton International Program (WIP) or take a Global Modular Course (short-term, half-credit courses) or Penn Global Seminar (intensive semester-long seminars combined with a short-term travel component led by the course instructor). Students also have the option to study abroad in a summer program that is not affiliated with the University of Pennsylvania. Students interested in non-Penn programs should review the policy on transferring credit for these courses.